Extra large size, stainless steel case, rhodium plated silver sunray dial, automatic winding mechanical movement with chronograph function. Includes interchangeable stainless steel bracelet, extra strap, and a stainless steel deployant buckle. Water resistant to 100 meters (330 feet). 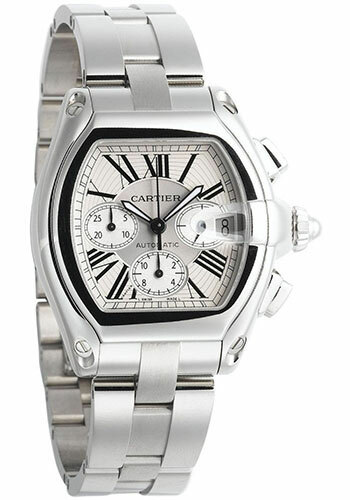 Extra large size, stainless steel case, black sunray dial, automatic winding mechanical movement with chronograph function. Includes interchangeable stainless steel bracelet, extra strap, and a stainless steel deployant buckle. Water resistant to 100 meters (330 feet). Extra large size, stainless steel case, rhodium plated silver sunray dial, automatic winding mechanical movement with second time zone function. Includes interchangeable stainless steel bracelet, extra strap, and a stainless steel deployant buckle. Water resistant to 100 meters (330 feet). Extra large size, 18K pink gold case, walnut burl dial, automatic winding calibre 3110 movement, with walnut burl center links. Water resistant to 100 meters.